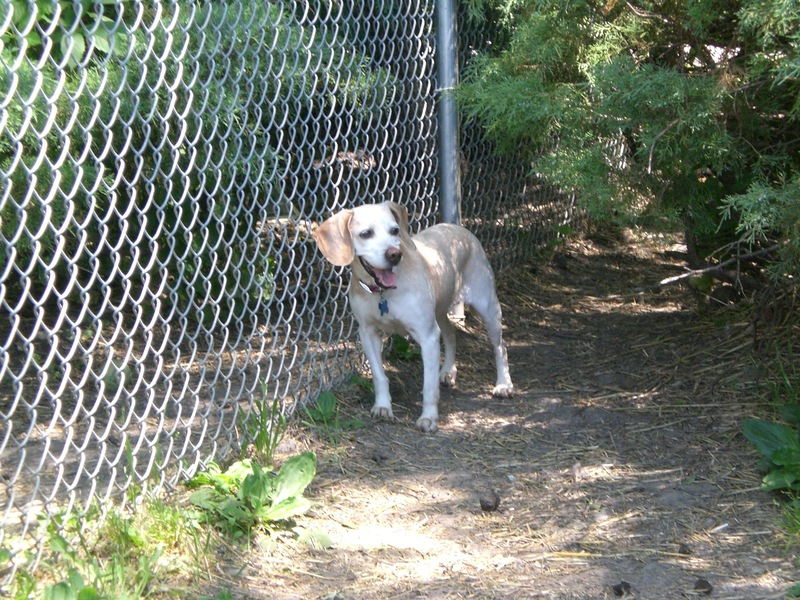 Clara the five-year-old Beagle mix has been a little sad recently, because her sister Clarice got adopted and little Clara is still waiting for her new forever home. To cheer her up, I took her out to play in the run. Although Clara’s face looks about as Beagley as you can get, her coloring is very unique: instead of tricolor, she’s almost the color of some yellow Labs. She also seems to be a bit smaller than the average Beagle. Clara was a little nervous about loud noises, but I know from experience that this skittishness will start to disappear as soon as she feels comfortable and secure in her new home. And who wouldn’t be a little skittish when a big garbage truck making lots of noise pulls up right next to you? Clara ran for the bushes, but I was able to coax her back out. Clara is the type of dog who wants to please. Even though I could tell she was nervous, she still came (in a roundabout way) when I called her. She hopped up onto the bench next to me and peered around me to see what was going on outside of the run. She is a sweet little girl who could use some extra loving right now. Savannah wasn’t such a fan of the midday heat. She spread out on the ground and wagged her tail when I came over to rub her belly. I convinced her to come sit in the shade with me, and we both enjoyed it when a breeze came through. 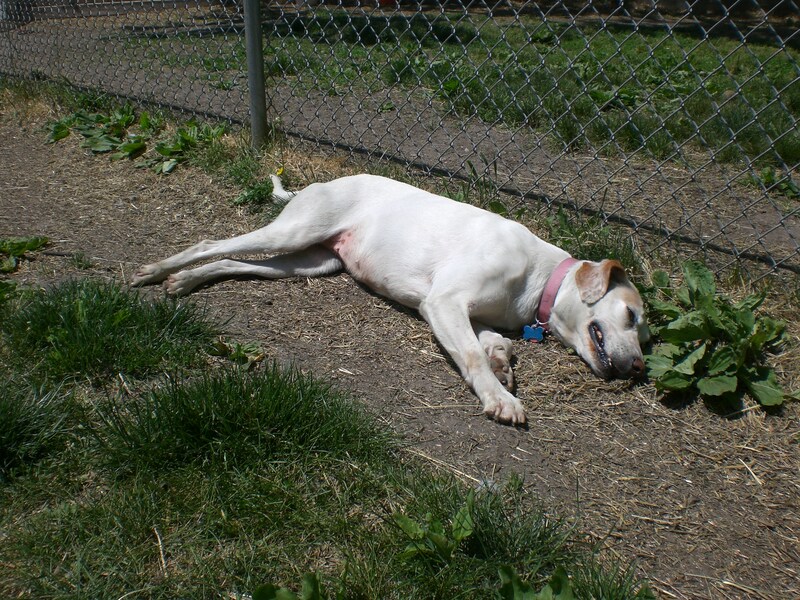 I took her on a walk around the property before heading back to her kennel, and she plopped down in a shady spot again. It took some persuasion to get her out of the shade, but we eventually made it back inside. 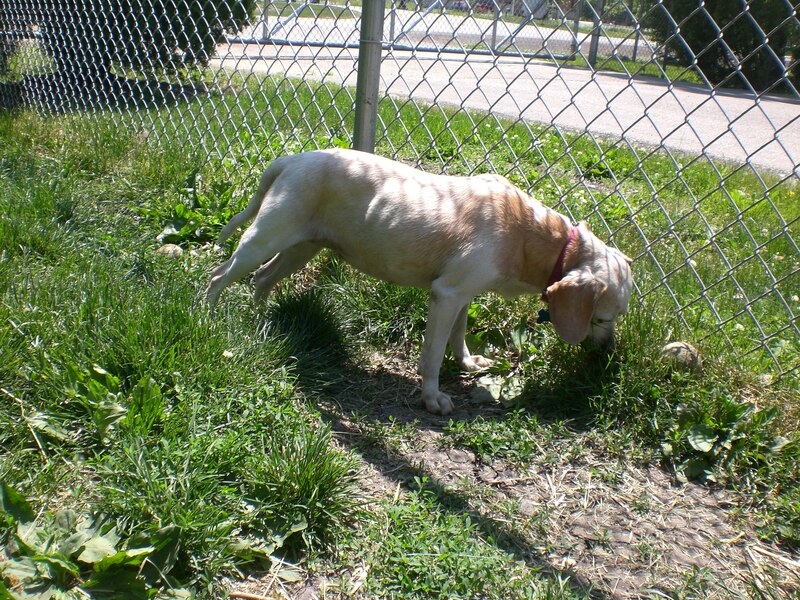 Savannah is another dog who seems eager to please. 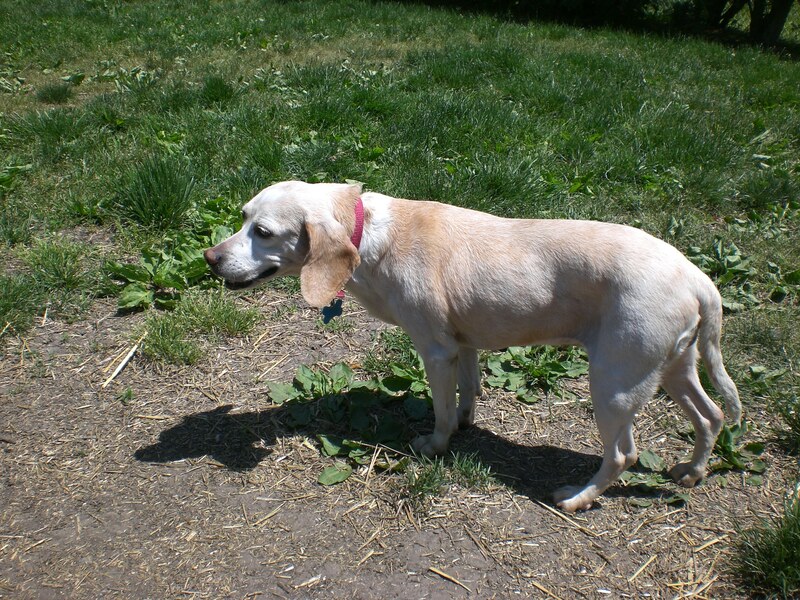 She was very sweet, calm, and gentle, and wagged her tail whenever I approached her or whenever she walked up to me. 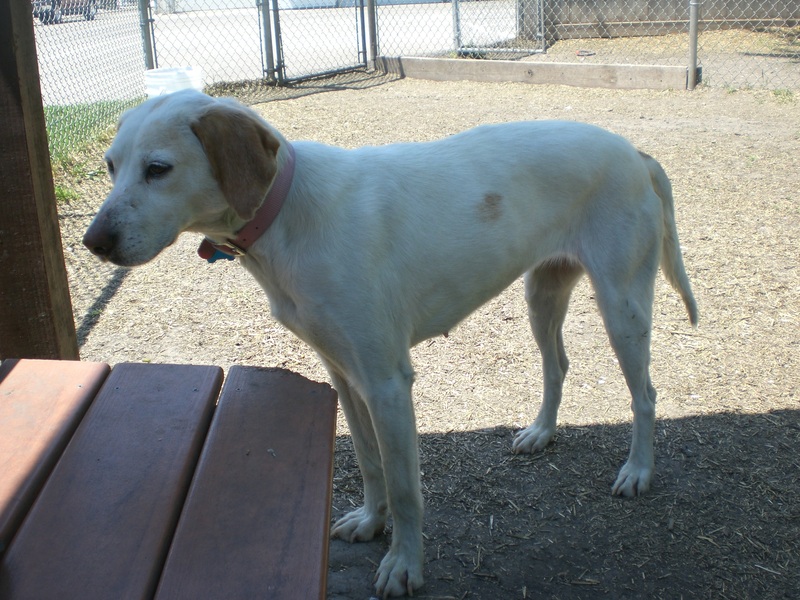 She’s currently towards the back of the main dog wing of the shelter, so be sure to check every kennel when you visit so you don’t miss out on a great dog like Savannah! 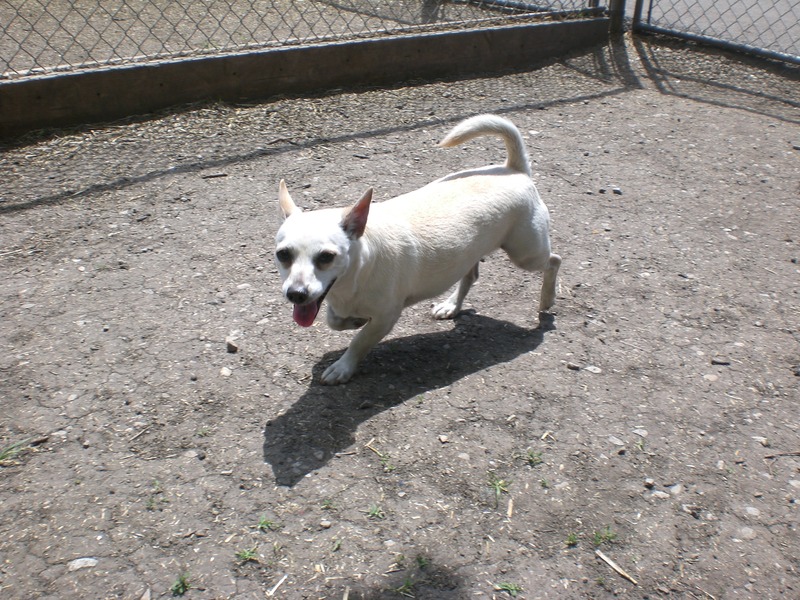 Lucky the six-year-old Chihuahua mix is a relatively new arrival to Orphans of the Storm®. He was a pet, but the woman had to give him away because her grandchild was allergic. Poor Lucky! He still has an upbeat, happy personality, even though he ran into some bad luck. Lucky‘s little legs can move pretty fast! He was scurrying around the run, investigating every corner and nibbling on some extra-tempting grass. 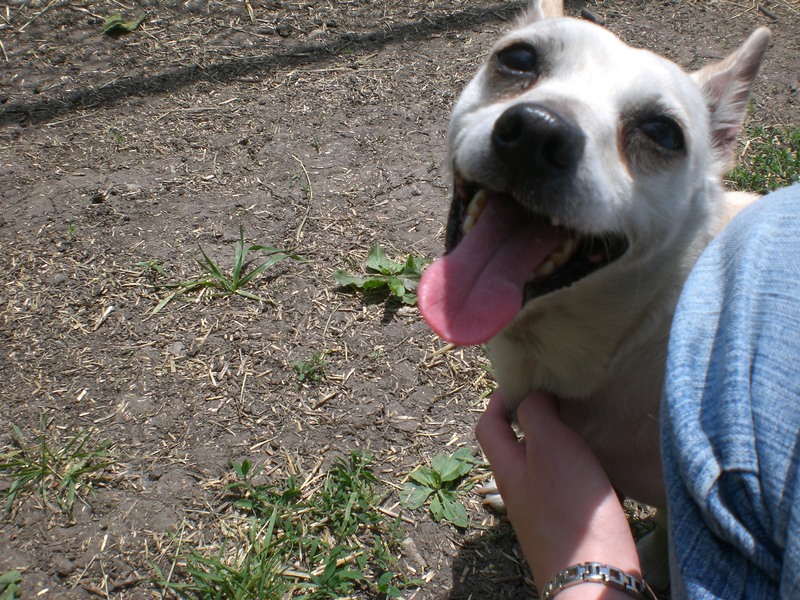 When I knelt down to his level, he put his little front paws in my lap and grinned up at me. He especially liked being scratched by his hips. Give this pooch some exercise, and then he’ll happily cuddle up in your lap. Help turn Lucky’s luck around and give him a chance at his new forever home. With years of experience as a pet, it’s a pretty safe bet that he’s housebroken and knows at least a few basic commands. He’ll be thrilled to have a new owner to play and snuggle with! 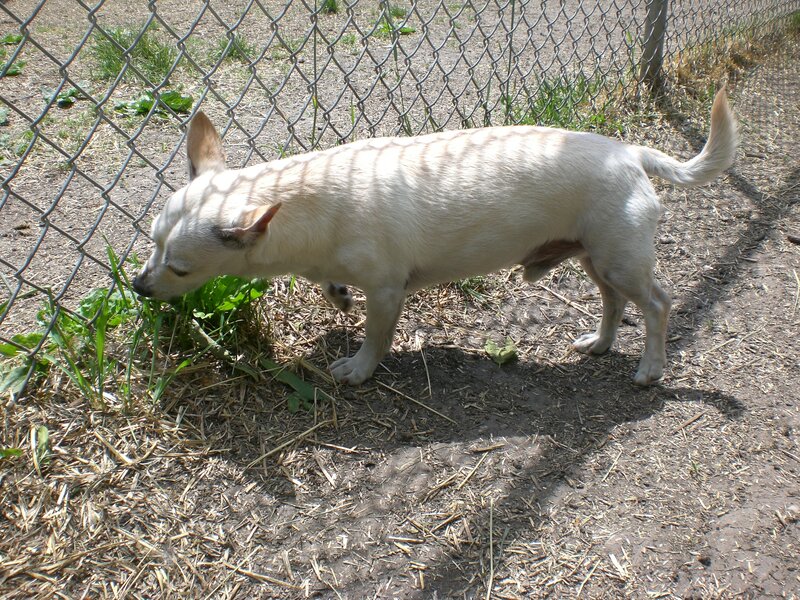 Posted by Meet the Pooches on May 26, 2012 in Dog Profiles and tagged adoption, animal shelter, Beagle, Chicago, Chihuahua, dogs, Hound, Orphans of the Storm, pets, Shepherd. Ohh. Feeling sad because I did wish to adopt Clara. Timing was off for us. Sure hope beautiful Clara is in a happy forever home.